For our next Hawthorn alteration tutorial we are breaking down the wide/narrow shoulder adjustment. I wanted to include this one because the shirtdress style is all about striking a balance between a masculine tailored look on top and a feminine flow on bottom. With that in mind, it is important that the cap of the sleeve hits the correct part of your shoulder. If your shoulders are wide, the bodice might feel tight across the back. In front, it pulls across the upper chest. The armhole seams appear to be pulling in towards each other with the strain from your shoulders. For narrow shoulders, the armholes sit too far out and off the shoulder. There is also an excess fabric across the upper chest and upper back. The steps for these two common fit problems are the same up until the end, so whichever one you’re doing, follow along! 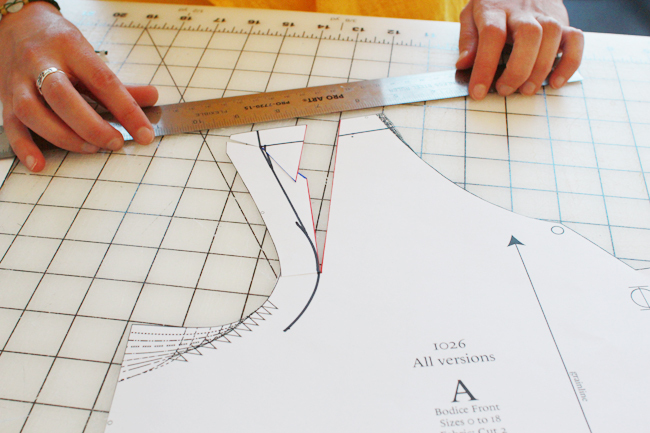 Step 1: Mark in ⅝” seam allowance starting at the bottom of the armhole curve, up to the shoulder and over to the neckline. Step 2: Connect dots to fill in the seam allowance line. 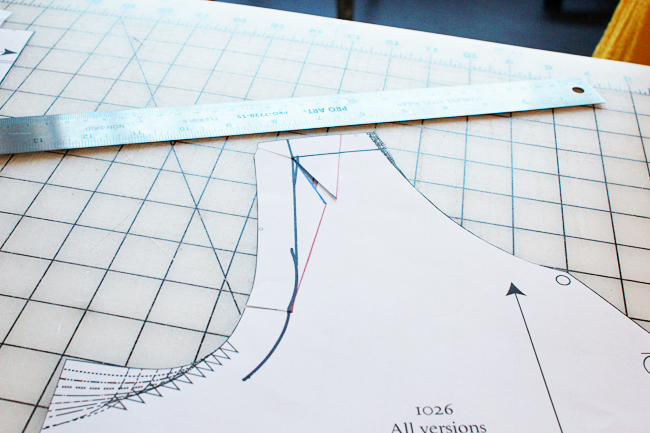 Step 3: Draw a slash line from the curve of the armhole up to the center of the shoulder, as shown below in red. 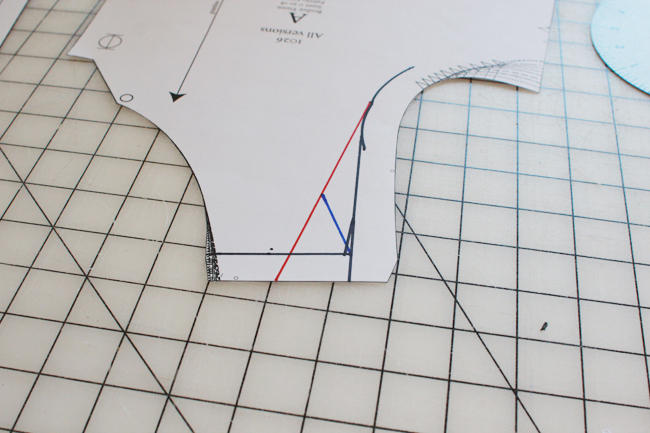 Step 4: Draw a second slash line from your previous slash line to the corner of the seam allowance where the armhole turns to the shoulder, shown below in blue. Step 5: Cut through shoulder seam allowance down along red slash line 1, up to the seam allowance marker line but not through it. 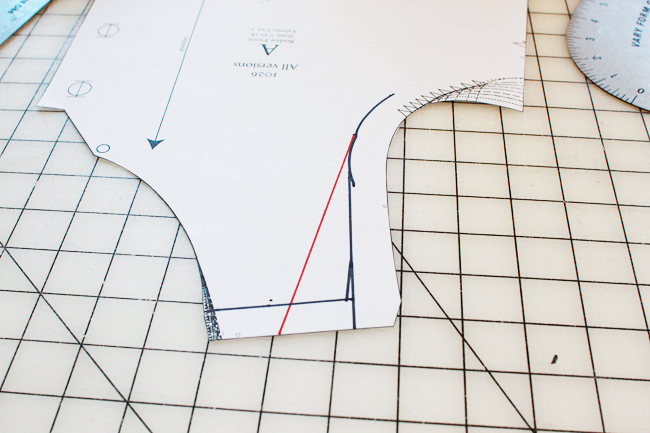 Cut through armhole seam allowance up to your marker line but not through it, enabling the shoulder to pivot. Step 6: Cut along blue slash line 2, up to the seam allowance marker line but not through it. Cut through seam allowance at the corner, up to the marker line but not through it, again allowing the pattern pieces to pivot. Swing the pieces in to remove excess fabric if performing a Narrow Shoulder Adjustment. Swing the pieces out to add ease if performing the Wide Shoulder Adjustment. 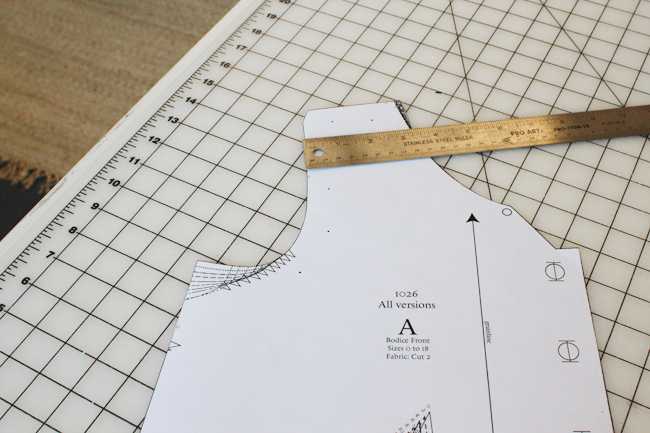 Once you’ve done the front bodice, do the same to the back bodice, so they match at the shoulder seam. And you’re done! You shouldn’t need to make any armhole adjustments as a result since you’re not changing the length in any way, just the curve. 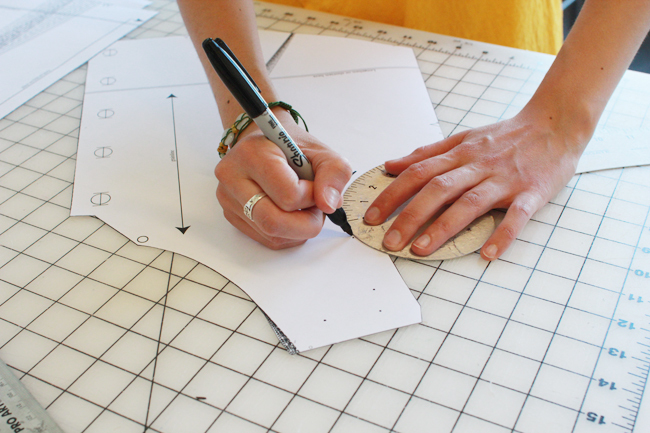 Stay tuned for our final alteration tutorial on Friday, when we will be showing you how to check the fit of the cuff. Is there a recommended order for making adjustments? I’m assuming I may have to make both full bust and narrow shoulder adjustments. I see several muslin bodices in my future – may just use an old bedsheet from the paint dropcloth pile! If you think you’ll be doing both adjustments, you can use the first muslin to measure out the amount you need added to the bust and removed from the shoulder. It might look a bit messy, but you can make the FBA and then the shoulder adjustment on the sape pattern piece. Make a second muslin to check the final fit. I’ve started making some adjustments (SBA) and I probably need to make this wide shoulders adjustment too (I know, small bust, wide shoulders….lucky me!) Anyway, I had a question, if making a muslin in order to adjust the fit, should we sew on the buttons and buttonholes – otherwise you can’t really get a proper fit to the bodice, without them. Am I right? I was hoping to just be able to pin the bodice closed at the front on the pattern markings, but I don’t think it’s going to be accurate enough. What is everyone else doing? This might sound weird and not very dressmaker-like, so caveat. But when I’ve done muslins for button-ups, I’ve actually just marked the button placement and stapled the fabric together at the marks. It’s quicker than sewing on buttons, but (for me, at least) it shows me if there are gaps or any strain better than when I’ve used pins. Thanks a lot for sharing this. With my narrow shoulders,this is what just the doc ordered for me that is whenever I think to use commercial patterns, since I self draft most of my patterns, but in the free downloaded ones, I can do this alteration for sure. Thanks once again ! I agree, I feel like sewing a commercial pattern without making any alterations is basically the same as buying cloths off the rack instead of custom. If I am going to put the effort into sewing something from scratch, I’m gonna want it fit like a dream! Makes it seems so do-able. Full bust and narrow shoulders solved! Neat! This looks similar to the method of narrowing shoulders in Leighty’s “Fitting and Pattern Alteration” , but the photos make it much easier to understand. How do you know whether it’s better to start small and do a FBA or start with the size as per measurements and then potentially have to do a SBA and a shoulder adjustment? That’s a great question. One way to evaluate this is by thinking about your cup size in relation to your body. Your cup size measures the fullness of your bust, so if you have a larger cup size (over a D cup), it’s more likely you’ll want to do the FBA. You should also take a look at other measurements, like your waist measurement, to help you choose the right starting size. 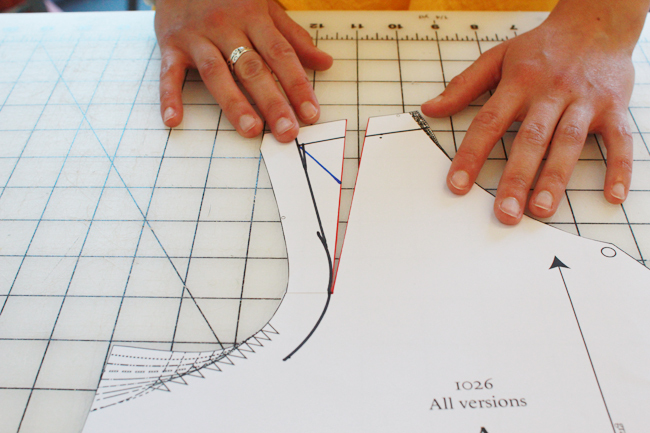 A final tip would be to take a garment that fits you well and measure that, and compare it to your pattern measurements. That can really help you decide on the right size to start with! So that’s how you do this! As a novice, I have just been mangling my patterns by folding and pinning them to narrow the shoulders. Tut, tut, self! The Coletterie is not only teaching the masses how to sew properly, but protecting innocent patterns everywhere. My patterns and I thank you. Thank you!!! I have a very narrow upper chest compared to my full bust and I have never known how to do an adjustment like this that didn’t distort the pattern severely. Thank you so much I really appreciate it. You have just changed my sewing life forever! I’ve never done this alteration. I usually just cut a smaller size at the shoulders but I’m gonna try this on Hawthorn. I also have to do a forward shoulder alteration as well as an FBA. I guess I do forward shoulder then narrow shoulder, then FBA cos I’ve heard the forward shoulder alt can lessen the FBA. We’ll see. How do you do a forward shoulder adjustment, please? I’m just starting on the Sewalong since I was on vacation last week. I’ve attempted one other Colette pattern but didn’t finish because I had so many adjustments to make. I tried a Jasmine the week before, assuming a week would be plenty of time since I had time off work, but I had so many muslins to go through I didn’t get a final version made. So now I’m not sure which Colette size is right for me. I’m right between 12 and 14 for both bust and waist, but when I made a 14 in Jasmine, the upper chest was way too big, and when I made my next version, a 12 with FBA, the shoulders were still way too big. Should I be safe just making a 14 in Hawthorn and then using this adjustment to fix the shoulders? I think that sounds like a good place to start. Unless you think the shoulder width might have been due to some other factor (like the bias cut of the Jasmine, shoulders getting stretched out, etc), it sounds like the shoulders are the problem area that you need to adjust. I made my Hawthorn muslin, and it had the exact same shoulder issues. It’s also got a similar huge (2.5+ cm folded, so 5.5+ cm total) wrinkle at the back waist, and the shoulder seams are pulled forward about an inch. I think I also need to make a small FBA, but I read somewhere I should fix the waist before working on that. I’ve got a copy of Fit for Real People ordered, so I think I’m going to wait on that to arrive before I tackle so many fit issues. At least now I’m making my muslins with a pattern that isn’t bias-cut, so they’ll go much quicker. Hope it’s not too late to post a question here! I fit pretty well into most Colette patterns (after a grade up a size for hips…) but the back is usually big. Happens with most pattern makes actually. I use my high bust to determine my size so it will fit my frame, and the front looks fine – but the back neck – heck, the whole back – usually gapes. If it’s a plain neck I usually just lop a bit off the back seam, like half an inch the whole way. But with a collar, I don’t know if I should work on the shoulders instead. Can anyone help? When the back is cut on the centerfold, you can simply remove the excess there. I usually remove 1/2″ from the center back fold because I have the same issue. How do you adjust the collar for that? Thanks for this. I am making muslins for Laurel and the armscythe feels too tight. I will try the wide shoulder adjustment and hope it works! Thank you! Thank you! When I sew for my dd, I didn’t know how to adjust for wide shoulders. I kind of wing it and hope it works. Now, I can figure out how to adjust thanks to your tutorial! This post is amazing, thank you so much for sharing! Love the way you explain, so easily, so graphic and intuitive. Thanks once more for your usefull instructions. The additional pictures from the shoulder adjustment on the Anise sewalong helped me with this adjustment: https://www.coletterie.com/sewalongs/anist-sew-along-wide-or-narrow-shoulder-adjustment. I should have read this yesterday! I have made a muslin, thinking I’d need a FBA but it fits ok across my bust, what I do have it bagginess above my chest, which I put in a v small dart to get rid of it (but I don’t think that is great). I am going to try this! It might be 3rd time lucky on my muslin! I found the fitting at the back ok (not too gapey!) I also found it a bit wide at the top of the side seams but fitting ok at the waist. I know this post is from a while ago now, so I hope it’s not too late to ask a question? I’m just wondering about how this adjustment will affect the sleeve head? I’ve also read the shoulder adjustment post from the Anise sewalong & have seen no mention of it affecting the sleeve in any way (which is just what I’m hoping, of course :) ) Am I right in thinking this? We’ve got you covered, Jenny! If it is less then 1″ either way, you shouldn’t need to adjust the sleeve. If it is more than a 1″ adjustment, simple lengthen the sleeve head a bit for the narrow adjustment, or shorten it a bit for the wide adjustment. Add or remove the same amount as your add/subtract from the shoulder. What’s the angle on the blue line? Am I bisecting the corner or meeting a certain point on the red line or making the perfect triangle I see in your illustration? Only that small thing confuses me as I’m not too skilled at pattern adjustment. Otherwise bless you for these clear and simple instructions. As long as you start the blue line at the corner and end at near the middle of the red line, you’ll be fine. It’s not an exact science, but you’re essentially dividing the red line in half. Can you please tell me how to make this alteration on a jacket pattern with princess seams? I have one lower shoulder and have found nothing out there to address this problem. Can you give me some ideas?